As a 501(c)(3), the Reclamation Society runs predominantly by the generosity of volunteers as a majority of donations go to our projects. All are geeks who are bought into our core--digging deeper into geek stories to uncover Truth. Jay prefers the title "Chief Storyteller" to "Executive Director," but technically serves as both. He's a producer on all the Reclamation Society's projects, and was the head writer for Star Wars: Rivals (Ben Anklam served as co-writer) and Death of a Bounty Hunter. He's also one of the hosts of The Story Geeks podcast, The Story Geeks LIVE Show, and writes, performs, and edits The Story Geeks short-form videos. In former positions, Jay has been involved in tech/nonprofit startups, marketing roles, and business strategy roles. He has also co-produced/co-written several short film projects and has placed three scripts in the Top 10 of the 168 WOP Screenwriting Competition. Nathan serves as the Reclamation Society's Art Director, though does a lot more than that, especially behind the scenes. He edits and creates art for The Story Geeks podcast, tackles any coding that needs to be done, and operates as Jay's most trusted confidant and story consultant (Nathan plays a huge role in making everything Jay writes better, basically). In Nathan's former roles, he has variously served as software engineer, game developer, illustrator, and web director for assorted startups and large nonprofits. He also manages the art blog, Albino Kraken, where one can delve into a myriad of his sketches and art projects. If we HAD to distribute a "biggest/most knowledgeable geek award," Daryl would win. Which is awesome, because that makes him a fantastic host! Daryl hosts both The Story Geeks podcast and our LIVE Show. His favorite character is Batman (which you know if you've listened to or watched one of our shows), and his favorite director of all time is Christopher Nolan. Daryl volunteers for the Reclamation Society, but also serves as a worship pastor and has had former roles in marketing. First off, as you can see, Ashley cosplays as Rey, so that's an epic start. But, as another Reclamation Society volunteer, she's also an insightful and skilled writer! She responds to every podcast with an in-depth blog post that we post alongside the audio on The Story Geeks blog. 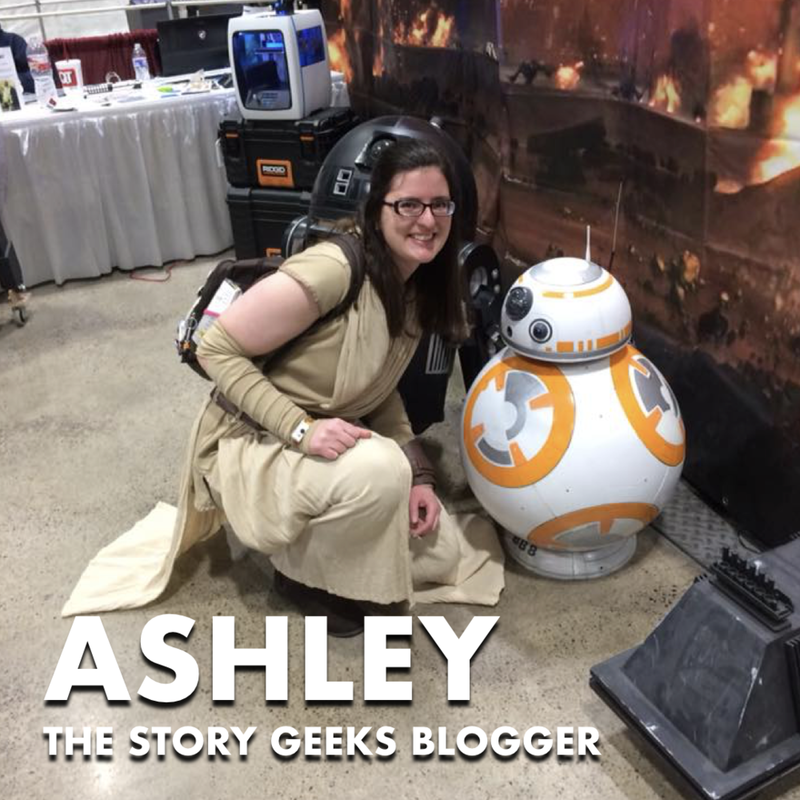 Ashley also writes blog posts for our good friends over at the ESO Network, so be sure to catch her there as well! Freddie volunteers for the Reclamation Society by bringing his technical expertise to The Story Geeks podcast and our LIVE Show. But, he's also well-qualified as a geek contributor. Do you enjoy chatting with "The Story Geeks" in our YouTube LIVE Show chat? You're probably chatting with Freddie! It's pretty rare to be able to find an independent contractor who is ALSO a geek, but Caitlin fills both roles. She's probably the biggest Star Trek fan of the crew (though, she might have to battle Ashley for that title). If you're conversing with us on The Story Geeks Twitter, there's a good chance you're chatting with Caitlin! In addition to serving as the Reclamation Society's board chair, Marianne also earned all of her geek cred by starring in Star Wars: Rivals, our first short film (a Star Wars fan film). Marianne and her husband, Christen, also served as producers on that film. If you'd like to see what else Marianne has been up to, you can check out her IMDB page.